The Glynn County Sports Hall of Fame is set to host its 2019 Ambassadors Event on Saturday, April 13, at the Brunswick High School Auditorium. The annual event honors outstanding senior student-athletes at the three major local high schools – Brunswick High, Glynn Academy and Frederica Academy. 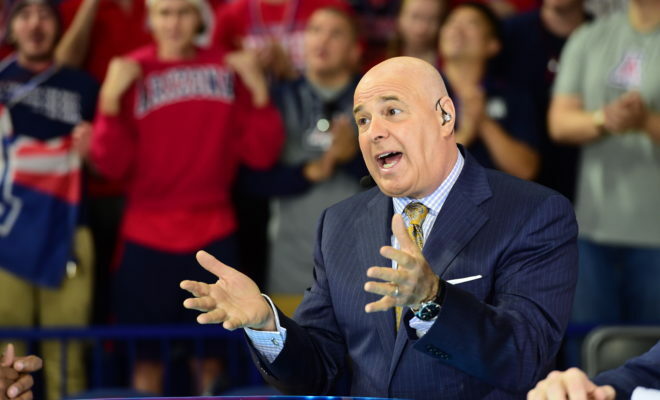 This year, the Hall is proud to announce that former Virginia Tech head basketball coach and current ESPN college basketball analyst Seth Greenberg will be the featured speaker at the event. Greenberg is currently busy working college basketball’s postseason as part of his television and radio duties with ESPN and his appearance here will come just days after the completion of this year’s NCAA men’s tournament on Monday, April 8, date of the championship game in Minneapolis. The Ambassadors Event will begin at 6:30 p.m. Admission is free for all local middle school and high school student-athletes, coaches and athletics administrators at the respective schools. Each of the high schools mentioned above will have eight honorees who will be recognized during the program for their outstanding academic and athletic achievements during their prep careers. Also, the Hall of Fame will again award scholarships to student-athletes from each of the three schools. The winners have been predetermined but will not be announced until the night of the event. The Hall began the Ambassadors program in 2014 as a community outreach initiative to help fulfill its stated mission to give back to the community while also working to preserve Glynn County’s athletic history through the formation of the local hall of fame. In 2015, the Hall of Fame board of directors voted to institute the scholarship component and award a $1,000 scholarship to a deserving student-athlete from the three local high schools. Since the program’s inception, the Hall has honored nearly 100 local student-athletes and presented 12 scholarships to the college-bound seniors from the schools over the last four years. The Hall of Fame works in conjunction with school administrators to identify the honorees each year from the respective schools and also to determine those who receive the Ambassadors scholarships. For the first three years of the Ambassadors program, the Hall recognized the student-athletes as part of its yearly Hall of Fame induction banquet. But when the Hall board elected to start holding an induction ceremony every other year following the 2016 induction on Jekyll Island, the sports hall opted to honor its Ambassadors at a separate function. Thus in 2017, the Hall partnered with the Golden Isles Basketball Association which was having an event featuring speaker Mike Lutzenkirchen from the Lutzie 43 Foundation that attracted several hundred youth. The Hall found that honoring its Ambassadors in front of their peers and having them also hear a powerful message was a success. So, in 2018, even though it was an induction year, the Hall board decided to keep the Ambassadors Event as a separate program. Last April, former Brunswick High and Auburn basketball standout Aaron Swinson, who was a 2012 Hall of Fame inductee and a current college basketball coach, spoke to an audience that included the Ambassadors, their families and other local student-athletes who attended. This year, the Hall is once again strongly encouraging the schools and their coaching staffs to have their student-athletes attend in hopes that they will take away something from the event and the featured speaker’s remarks that will influence them to be the best student-athlete and citizen they can be going forward. The Hall is excited about hosting the Ambassadors Event again this spring as it looks to take the event and program to new heights. “We are proud of this program and what it has become in a short time,” said Kevin Price, president of the Hall of Fame. “Each year, I am amazed at the many accomplishments and achievements by our Ambassadors, and we feel like they deserve to be honored and recognized for truly being outstanding students and also good athletes who really exemplify what it means to be a student-athlete. “And, we are fortunate to have the financial backing from supporters who believe in us and believe in helping kids in this community which enables us to sponsor the scholarships and fund this event. “But while we are honoring this group of graduating seniors, we really are stressing that this event is open to all student-athletes. We want them to come see what our Ambassadors have accomplished and hopefully they are motivated to strive harder for their own academic and athletic success. We also want them to hear from our guest speaker who is someone with a background in athletics who in any given year will be talking to them about hot-button issues that pertain to athletics and thus pertain to them, whether they are still in middle school or already in high school. To learn more about the Hall of Fame and the Ambassadors program, please visit the Hall of Fame’s new website, www.GCSHOF.com.